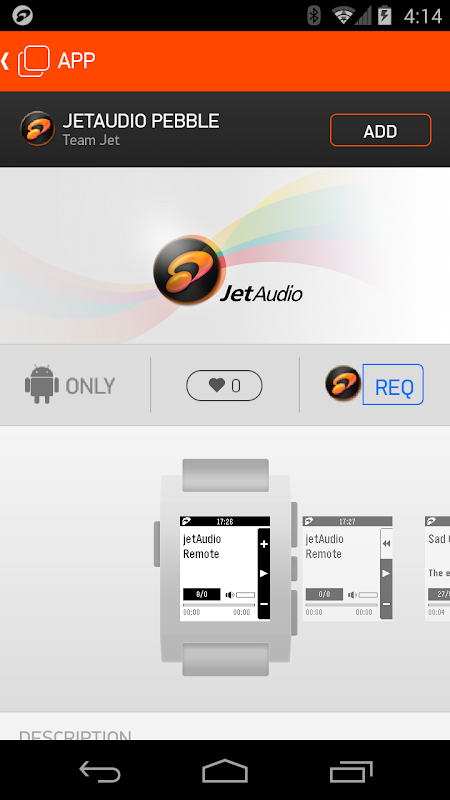 jetAudio for Pebble is a music app for Pebble smartwatch to control jetAudio for Android music player. (!) The application requires jetAudio Basic (Free) or Plus (Paid) for Android and activated through in-app purchase to work properly. If you have not installed jetAudio before, please try jetAudio first before downloading this app. Download jetAudio Basic: https://play.google.com/store/apps/details?id=com.jetappfactory.jetaudio Download JetAudio Plus: https://play.google.com/store/apps/details?id=com.jetappfactory.jetaudioplus -- Features -- * Adjust volume with your Pebble * Play/Pause, Next, Previous function * Displays song information * Displays progress * Displays current and remaining time -- Install -- * After downloading this app, choose Install to install watchapp on your Pebble smartwatch. -- about jetAudio for Android -- jetAudio for Android is a music player with 10/20 bands graphic equalizer and various sound effects. It plays almost any type of digital music files you have (.wav, .mp3, .ogg, .flac, .m4a, .mpc, .tta, .wv, .ape, .mod, .spx, .wma* and more) and, it provides a very high quality sound with various effects and enhancements such as Wide, Reverb, X-Bass. It comes with 32 equalizer presets that will provide a wide array of listening experience. For those who would like to customize their own sound experience, it also allows 10/20 bands graphic equalizer and other advanced playback functions including playback speed control, crossfading, AGC and much more. Free Basic version provides same features with Plus version except advertisements and some features. To enjoy full features of jetAudio, please purchase Plus version. 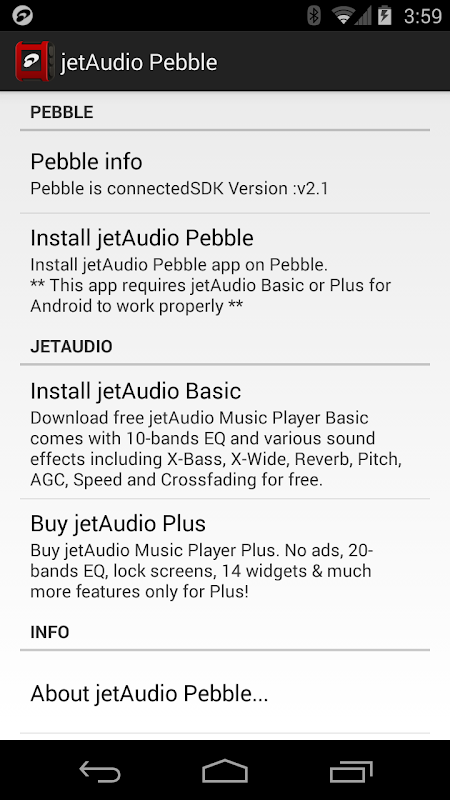  Is jetAudio Pebble yours? Claim it!